required to be posted on company websites. On January 10, 2017 the EPA Office of Compliance sent a “Compliance Reminder” letter to all stove and boiler manufacturers because some manufacturers were not complying with transparency, reporting, and record keeping requirements. At issue is the requirement that manufacturers 1. 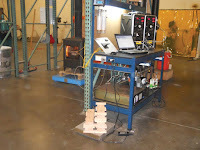 Post non-confidential certification test lab reports on each of their stoves on their websites, 2. Implement a quality assurance plan that is approved by a third party certifier, and 3. Submit a report to the EPA every two years about sales and other information. We found and commended companies like Blaze King, Jotul, Kuma, J.A. Roby, Seraph, Travis, and Woodstock Soapstone who posted some or all of their test lab reports. However, we found the largest company of all, Hearth & Home Technologies, did not. Two weeks later, they had posted the required reports. A pdf of the full compliance reminder letter, signed by Director Edward Messina, can be downloaded here. It was copied to HPBA, NESCAUM, WESTAR, NYDEC, and NYSERDA. The Alliance for Green Heat obtained a copy on January 24. The Alliance for Green Heat is concerned that in many instances, some stakeholders, including the stove retailer community, are not privy to such letters that the EPA shares or directs to industry, states, and air agencies. When there is widespread non-compliance, the EPA has relied on compliance reminder letters in the past, partly to assure manufacturers that there is not selective enforcement, but that all manufacturers need to play by the same rules. In May 2013, the EPA sent a tougher letter to manufacturers of qualified outdoor boilers, giving them seven weeks to remove exaggerated efficiency numbers from their hang tags and advertisements. This letter did not give any deadline for compliance. Wood and pellet stove companies improve ratings with the Better Business Bureau; but does it matter? In the age of Yelp, Facebook, and Angie’s List, millions of consumers still look to the Better Business Bureau (BBB) for ratings. 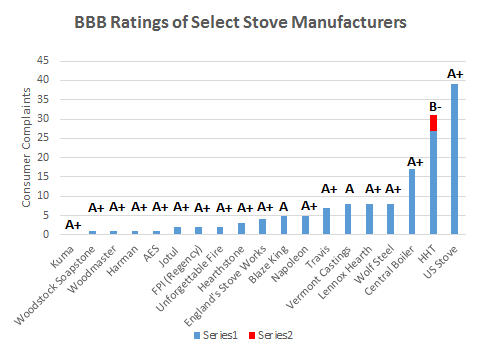 While the BBB may have lost some of its luster, we have always urged consumers to consult it when buying a new stove. 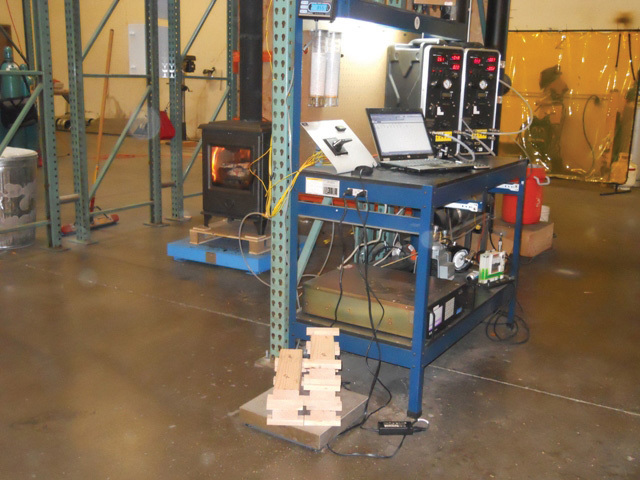 When the Alliance for Green Heat reviewed BBB ratings for wood and pellet stove companies in 2013, most companies got A ratings, but some got Bs, one got a C and one got an F rating. As of January 2017, the same companies all have A+ ratings, except Hearth & Home Technologies, which has a B-. Does this mean that stove companies have all become more trustworthy and reliable or that the BBB has become easier to manipulate? We think the answer lies more in the inability of the BBB to carefully assess every company. The recent ratings show the limitations of the old business rating model which the BBB was based on. However, the BBB still provides some useful information about stove companies. First of all, look at which companies are actually accredited by BBB. Only Blaze King, Kuma, and Woodstock Soapstone are accredited, which means that they have provided written assurances that they meet BBB criteria. That doesn’t necessarily mean a lot, but the Alliance for Green Heat has independently confirmed that these three companies are among the few that consumers can trust to provide accurate data on their websites. Second, past BBB history is still important. US Stove, for example, got an “F” in 2013, because they had “a history of violating BBB name and logo policy and falsely stated BBB Accreditation (or membership).” (See our 2013 review of BBB stove company ratings). The Alliance for Green Heat has also highlighted numerous cases of misleading or false advertising by US Stove, some of which still continues. It’s important to understand the limitations of the BBB – and to rely on multiple sources. Unfortunately, Consumer Reports has done only a very limited review of pellet stoves and nothing on wood stoves. The Alliance for Green Heat rates some other review sites here. We searched the BBB site for all major stove companies and found many of them there. We could find only one European stove company (Jotul) and several Canadian ones. For companies that own several brands, such as Hearth & Home Technologies, we found some of their brands, such as Harman and Vermont Castings, but could not find others, such as Quadra-fire. Series 1 marks the number of resolved complaints. Series 2 marks the number of complaints that received no response. Keep in mind that this only tracks the complaints received by the BBB, and there are always many customer complaints not lodged through them. This may indicate that consumers can get better responsiveness from a stove manufacturer if they do file the complaint with the BBB. The points are added up and a letter grade (A as the highest, F as the lowest) is assigned accordingly. In order to receive a good score, the volume of consumer complaints that are not responded to must remain low. The BBB takes into consideration whether the business makes a speedy and honest effort to fix the problem and resolve the complaint. The response of the business can mean the difference between an A and a B score. For example, as seen in the graph, HHT received 27 consumer complaints. Despite this relatively low number, HHT still got a B- because it apparently was not sufficiently responsive to some of the complaints. Click here to read a full overview of the BBB grading method. 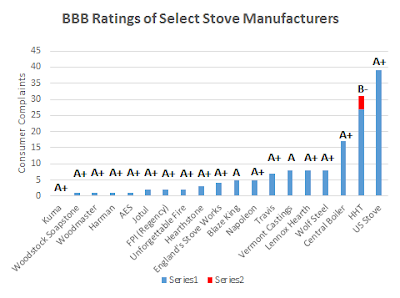 While wood stove companies fare relatively well on BBB, some other products in the hearth industry do not. For example, Heat Surge, the Amish "miracle heater" that is heavily advertised and is also a exhibitor at HPBA trade shows currently has a B rating and hundreds of complaints filed against it. The Alliance for Green Heat has previously written about the company here.